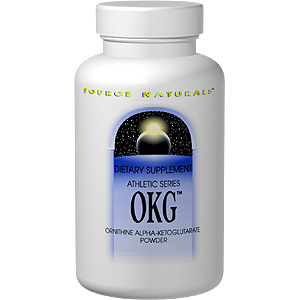 OKG (Ornithine alpha-Ketoglutarate) is a combination of the amino acid ornithine and alpha-ketoglutaric acid (AKG). OKG is used by athletes and those who want to improve performance. Source Naturals Ornithine alpha-Ketoglutarate OKG is suitable for vegetarians and HYPOALLERGENIC. One teaspoonful of OKG powder daily, mixed with water or juice. Warning: If you are pregnant or breastfeeding, consult your health care professional before using OKG Ornithine Ketoglutarate product. L-Ornithine (as ornithine alpha-ketoglutarate) 1.3 g, alpha-Ketoglutarate (as ornithine alpha-ketoglutarate) 1.8 g.
Other Ingredients: Stearic acid, modified cellulose gum, magnesium stearate and colloidal silicon dioxide. OKG Powder is shipped in a discrete, unmarked package. Orders are processed immediately and usually take about 3 to 5 working days to be received. We do ask that you try it for 2 to 3 weeks to feel the full effects. Any information received is used only for order processing and shipping purposes. Your information, such as e-mail address, will never be disclosed to a third party.